I'm not getting something about Visual Studio's Git for TFS. But when I look at the history of the modified file, there is none! I would like to commit my changes locally and sync them with the TFS server. and seeing lots of changes not staged for commit and untracked files. Q: Where is the Git stage? A: If you are an experienced Git user, you might have noticed that Visual Studio handles changes differently than the command prompt. You might have wondered if the Included Changes section contains your staged changes. In fact, Visual Studio usually bypasses the Git stage for you. When you commit changes, Visual Studio simultaneously stages and commits them. The one exception occurs when you add a file to your Git repository; Visual Studio does stage this kind of change. 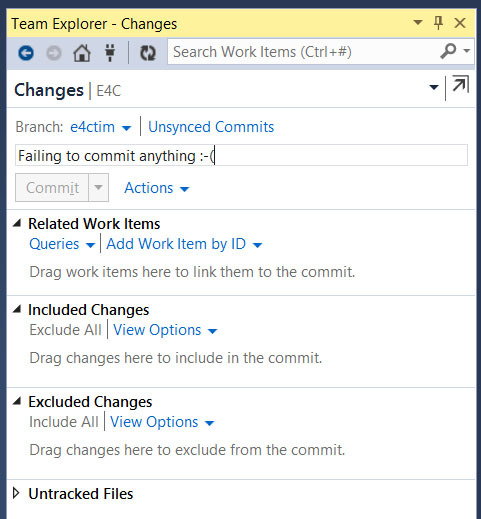 Visual Studio stages and commits changes simultaneously. But why is it not listing any of the modifications I have made to tracked files as changes, and thus letting me commit them? then Visual Studio suddenly became aware of the modifications and let me commit them locally and sync them with the TFS server. Moreover it then put the 'new file' green cross on the files I had added and I found I could do another commit and then another sync to pick up the additions and deletions I had made. Since then Visual Studio is doing what I would expect: when I make a change to the file the file is listed as changed in the commit window. I still do not know why Visual Studio failed to pick up the changes until after an initial git add but at least it works now. internally for staging the updates. If some of the files that you are trying to add to your changeset is open by another process, then the git command gets a permission error. And Visual Studio won't show the changes. In my case, I had a document in my repo that was open by another application, and that caused Visual Studio not to show the modifications because of the Git permission error. So check if any of the files of your git repository is not open by any other application. delete the file myProject\.git\index.lock fixed it in my case. I'm using VS 2015 Update 1 and also meet this problem. Furthermore, at the same time, the VS' output window told me my VC.opendb file under the solution folder is occupied by another program. 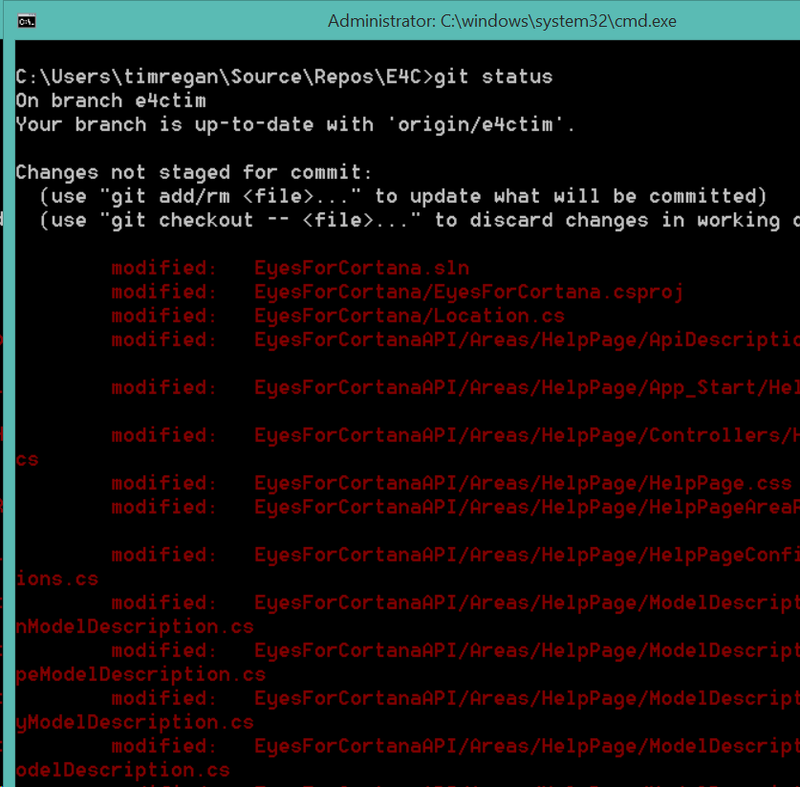 According to this, I fixed the issue of occupying: add *.VC.opendb and *.VC.db to the .gitignore file. Then everything goes well. I was having the same issue with Visual Studio Update 3. VS was saving locally but not picking up any changes so I couldn't commit. I downloaded Git for Windows from https://git-for-windows.github.io/ (thanks @fhilton), opened the Developer Command Prompt and changed directory to C:\Repos\Scheduler (the location of my source code). As others have said, it looks like the GIT tools in Visual Studio can fail silently, even for the most basic Windows level errors. Worse, it can tell you GIT is fully in sync. Command line is certainly your friend for the time being. Then i was trying to make changes but files doesn't get effected...There is a easy solution for this. The major problem is one of your git ignore files ignoring your files.. Helpful article! Using Git Bash (git add -u) helped me get closer to the cause of the problem. After committing changes previously not shown in Visual Studio, only half-way commit was done because of using a SQL Server Database Project; Apparently, Windows 10 started to add jfm-files in the same folder keeping it open all the time and preventing it from beeing accessed by VS. Solution was to add it to the .gitignore before committing. Not the answer you're looking for? Browse other questions tagged visual-studio-2013 tfs or ask your own question. How to connect an existing local git repository to its existing remote repository in Visual Studio 2013?